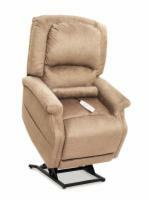 The AmeriGlide PR340 Heat and Massage Chair offers a perfectly balanced combination of comfort and support. The full body chaise and pad overstuffed seam back work in tandem with an innovative sinuous spring system to offer a superior level of comfort. Not only is this model a practical mobility device that will allow you to sit and stand with ease, it also features luxurious lower back heat and vibrating massage options for maximum relaxation. Best of all, it is available for an incredible value that can't be beat!